For ten years before the creation of Mickey Mouse, Walt Disney struggled with, failed at, and eventually mastered the art and business of animation. Most biographies of his career begin in 1928, when Steamboat Willie was released. That first Disney Studio cartoon with synchronized sound made its main character--Mickey Mouse--an icon for generations. But Steamboat Willie was neither Disney's first cartoon nor Mickey Mouse's first appearance. Prior to this groundbreaking achievement, Walt Disney worked in a variety of venues and studios, refining what would become known as the Disney style. In Walt before Mickey: Disney's Early Years, 1919-1928, Timothy Susanin creates a portrait of the artist from age seventeen to the cusp of his international renown. After serving in the Red Cross in France after World War I, Walt Disney worked for advertising and commercial art in Kansas City. Walt used these experiences to create four studios--Kaycee Studios, Laugh-O-gram Films, Disney Brothers Studio, and Walt Disney Studio. Using company documents, private correspondence between Walt and his brother Roy, contemporary newspaper accounts, and new interviews with Disney's associates, Susanin traces Disney's path. The author shows Disney to be a complicated, resourceful man, especially during his early career. 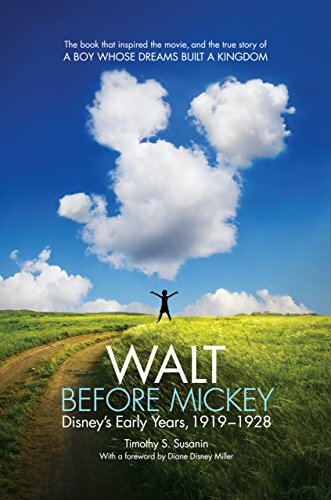 Walt before Mickey, a critical biography of a man at a crucial juncture, provides the "missing decade" that started Walt Disney's career and gave him the skills to become a name known worldwide.